I have one tarot deck that I use only for the first day of the new year. I have done this for over 20 years, and it is something I look forward to as a touchstone to set the themes of my year and to live with greater awareness and understanding. I don’t use it as a predictive tool – rather I use it for reflection, and to seek guidance about qualities, actions and perspectives that might benefit me over the next twelve months. This morning I asked for one card for you – to give YOU guidance over the year ahead. This is my personal interpretation of that card for you. Take what resonates as truth for you, and discard the rest. See 2012 as a year of great potential, as a year of great change. Change will happen anyway, for that is the nature of this Universe, and of our lives, but to actively drive that change will bring better results for you this year, and give you the satisfaction of personal empowerment, rather than being in an energy of just letting things ‘happen’ to you. 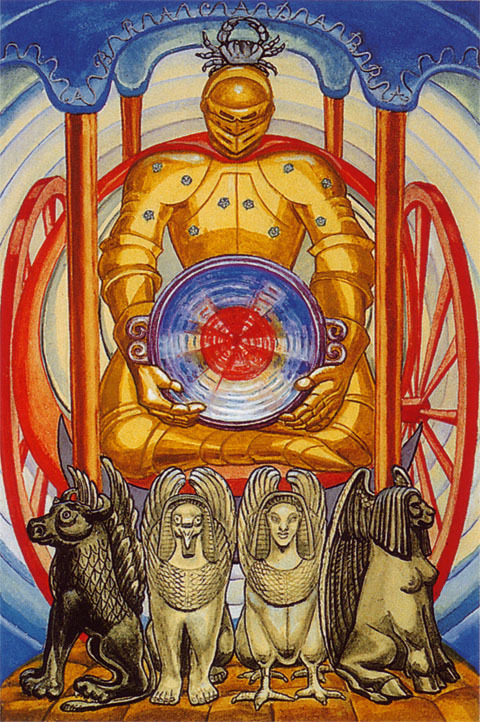 Make sure that you are the driver of your own chariot – it is unwise to give away your power, especially in charting the direction of your life. Give attention to the depth of your nature. You are a soul, having a human experience, and that experience is felt through the body, mind, emotions and spirit. Make time for each of these aspects, for when one is ignored it throws the others into imbalance, and the ramifications may cause the wheels to fall off your chariot, or at least slow you down as the tyres go flat. This year can bring such momentum for you, so it is wise to ensure the stability of your ‘vehicle’ by acknowledging and honouring your complex nature so that you can keep pace with this momentum without breaking or causing peril to yourself or others. Be mindful to make your life, relationships and practices sustainable. Be wary of over-committing and the propensity for this level of activity and stress to cause illness, depression and burnout. One again I want to emphasise seek balance between activity and quiet times. Some of what you have sown in the past (and had feared would never come to pass) will finally be available for harvest this year, but keep sowing seeds for tomorrow, and the days and years to come. Crops (of ideas, actions, thoughts etc) sown over 2012, and nurtured with enthusiasm, dedication and discipline will bring encouraging yields for you in the times ahead. Even if others are facing lean times, or talking of failure and doom, work diligently on your own dreams and trust in good outcomes. Allow home to be your anchor this year – devote energy to your dwelling space and how it supports you, and spend time on the relationships that matter. From that place of safe anchor then, dare to roam. Plan travel, seek out events and places that broaden your horizons and increase your education, knowledge and awareness. (This could even be done through books and the arts too.) Travel unfamiliar roads with an open heart and mind, but always hold the image of that safe anchor of home so that you stay oriented to who you truly are, and what truly matters in your life. This is a time of great soul growth, bringing with it the potential for deeper spiritual connection and inner peace. It is also a time for awakening to your innate talents, your psychic and metaphysical gifts, and the One-ness and inter-connection of all. Meditation and regular practice of such things as walking, yoga, qi gung and other forms of mindful movement will help to centre you in truth and awareness and to create stability between the physical and non-physical aspects of yourself. Seek teachers and activities that help you to grow in your chosen field; be that healing, writing, gardening, art or rocket science. If you want to make over yourself, your relationships, your career or the world in some way, 2012 gives you an exceptional vehicle for making this positive change a reality. But 2012 is merely a vehicle – you need to provide the fuel (through passion, health and energy), the direction (through clear goals and purpose) and the driver (you, rested and clear, and ready to take responsibility for your life). This entry was posted in Metaphysical Stuff, Soul Growth and tagged 2012, awareness, free reading, goals, happiness, healing, intuition, psychic development, soul growth, tarot, the chariot by Cauldrons and Cupcakes. Bookmark the permalink. I’m sure it will, Bel. Own this year – make the change you need by believing in yourself and putting your dreams first! Made me feel like crying Nicole, I so badly want this to be a year of change, moving forward towards a better, more whole and content me! Its motivated me to go and wash the heaviness of 2011 off me and sit to imagine/create 2012 in all its beautiful potential! Thanks once again Nicole, for sharing so generously! Yes, I believe this will be a great year, for me and many that I love. Your reading was very apt. I feel like I finally know where I am going and how to get there. The iron curtains are coming down and my heart is beginning to open. Life is just magnificent. All my love and thanks to you Nicole. Great post Nicole. I have a really good vibe about 2012. The advice to make sure we drive the change is excellent. Speaks to where I’m at right now, especially with my writing.